While jigsaw puzzles are challenging, an even greater task is to try to find enough documentary "pieces" to produce a picture of someone who lived long ago. When it comes to the American Revolution, the most challenging "puzzles" are those having to do with the Black Loyalists. The case of Daniel Herring is an excellent example of how scattered resources can give us the outline of one man's experience. On March 2, 1787, Daniel Herring placed his mark at the end of a petition to George Ludlow, the chief justice of the colony of New Brunswick. Describing himself as "captain of the Second Company of Blacks", Herring asked for an unoccupied lot of land on the "Narrow piece" near the St. John River. Already in possession of a fifty acre grant on which he had built a house, cleared the brush, and planted a crop, the Black Loyalist promised to do his "utmost to raise as much grain and vegetables as lays in my power". Within a month, Ludlow informed Herring that he could take possession of the requested lot. The petition is so maddeningly brief, but for the determined researcher it has just enough clues to begin a quest to learn more about Daniel Herring. The next step is to move from the Black Loyalist's petition to search the Book of Negroes. Compiled by British officials during 1783, this ledger contains the names of almost every free and enslaved black who left New York City during the loyalist evacuation. In the list of refugees who sailed out of New York on July 31, we find Herring's name on the manifest for the Clinton, a ship that carried over 250 members of four Black Loyalist companies to the mouth of the St. John River. His age is given as 35, and he is described as having once been the property of a white Virginian named Daniel Herring, Jr. The African's enslaver was a leader in his community and once served as a county officer at the courthouse in Smithfield, Virginia. Herring, the former slave, may have been all too familiar with the county courthouse for it was regularly used by auctioneers to sell Africans or hire out the services of slaves. The fact that the Black Loyalist carried his white master's name helps to pinpoint the exact spelling of his surname. It would be rendered as "Heron" or "Haren" in later documents. The Black Loyalist fled Isle of Wight County in 1779. No wife or dependents are listed. Given that he was a free man in 1783, Herring must have been emancipated by the British forces for his service to the crown after his escape. The next documents that shed light on Daniel Herring's life are the victualing musters maintained by the British army's commissariat at Fort Howe, a garrison that guarded the mouth of the St. John River. Besides simply keeping count of the rations given out to the loyalist refugees who came to the fort's gates between 1783 and 1784, the victualing musters also list the occupation, home, evacuation ship, and families of those who received food. In Herring's case, the ledgers also reveal a lost story of romance. The victualing ledger described Daniel as being "Haren", a black man who, by May of 1784, had a wife and child under ten. Herring arrived in Saint John in August of 1783. To have fathered a child by the following May, Herring had to have married on the voyage north or very soon after arriving in the refugee settlement. Perhaps he married one of the single mothers that he met on the Clinton's month-long voyage from New York to Saint John. His new wife's identity is a matter of pure speculation: the Clinton carried 17 single mothers with only one child who would still be been under the age of ten in May of 1784. All that the victualing musters can tell us is that the bachelor Herring who boarded the Clinton in 1783 had fallen in love and married – and had become a father – by May of 1784. The story of how that relationship began and grew is lost forever. With the Book of Negroes, the victualing musters and Herring's 1787 petition for land close at hand, we now need to look at a petition drawn up on January 6, 1785. Herring's name is not among the 35 Black Loyalists who wrote to New Brunswick's lieutenant governor, but most (if not all) of them were his fellow passengers aboard the Clinton and would have drawn rations at Fort Howe alongside Herring. The spokesman for the Black Loyalists was Richard Corankapone Wheeler, the man referred to as "Captain Wheeler" in Herring's 1787 petition. In his petition, Wheeler asks Thomas Carleton, the lieutenant governor, to provide grants of "back land" to thirteen Black Loyalist families. Up to this point in time, the free blacks had been living on what Wheeler described as "small lots" in Carleton, the refugee community across the harbour from Parrtown at the mouth of the St. John River. Now that the year of Fort Howe's free ration distribution was over, the blacks discovered that "they, their Wives and Children cannot subsist at Carleton" and were "under apprehensions of suffering this winter, labour and provisions being so very scarce". Wheeler reminded Thomas Carleton that "the Blacks in general have been thought Loyal and have throughout the Rebellion been generally ready to Obey an Orders from the British Commander". He pointed out that the Blacks wanted to "lead Industrious, honest Lives and instead of Being a Burden, should be an Advantage to the Community." Next week's Loyalist Trails will feature the conclusion of the quest for Daniel Herring, Black Loyalist. 3. those who moved to Kings County after initially settling elsewhere (Shelburne, Halifax, Port Mouton, etc.). If you know the name of a loyalist and (if married) his/her immediate family members who fit these parameters, please forward the information on to Stephen Davidson (loyalistsed@gmail.com) and Carol Harding (cmharding@bellaliant.net) This list, when completed, will be shared with the United Empire Loyalist Association of Canada. Burgoyne, surprised by the American withdrawal from Fort Ticonderoga, hurried as many of his troops as possible forward in pursuit of the retreating Americans. The main body of the American forces had departed Fort Independence down the road to Hubbardton, and a smaller body of troops, accompanying the sick, wounded, and camp followers that had also evacuated the fort, had sailed up Lake Champlain to Skenesboro, moving from there overland to Fort Edward. This group, which included about 600 men under arms, paused at Fort Anne, where a smaller advance company from Burgoyne's army caught up to them. The British, clearly outnumbered, sent for reinforcements. The Americans decided to attack while they had the numerical advantage, and succeeded in nearly surrounding the British position about three quarters of a mile (1 km) north of the fort. The Americans retreated back to the fort when war whoops indicated the arrival of British reinforcements. While this was a ruse (the reinforcements were a single officer), it saved the British force from probable capture. More of Burgoyne's army soon came down the road, forcing the Americans to retreat from Fort Anne to Fort Edward. It has been claimed that a flag was flown at Fort Anne that may have been the first instance of a flag consisting of stars and stripes; this claim is supposedly false. The Battle of Great Bridge represents a turning point in the Revolutionary War in Virginia and the southern colonies. Lord Dunmore, John Murray, Royal Governor of Virginia, requested and received a reinforcement of regular British troops to help quell the American rebellion in Virginia. On December 9, 1775, he ordered an attack on the Rebel, Patriot or Whig forces assembled on the south side of a narrow causeway and bridge that provided access to the Albemarle region of North Carolina. He ordered the attack because he was aware North Carolina troops under Colonel Robert Howe were en route to reinforce the militia and Virginia state troops of the 2nd Virginia Regiment at Great Bridge, under command of Col. William Woodford. Dunmore believed his regulars with loyalist militia support could dislodge the rebels before they were reinforced. Dunmore was wrong, his attacking regulars suffered significant casualties. The loss of the regulars of the 14th Regiment of Foot at Great Bridge demoralized Dunmore and his supporters leading to the abandonment of Norfolk to the rebel Whig forces. The loss necessitated the British abandon the State of Virginia to the Whigs allowing Virginia to devote significant resources to the rebels or Whigs throughout much of the American Revolution. Eberhard "Lo" Faber, an assistant professor of history at Loyola University, New Orleans and the author of Building the Land of Dreams: New Orleans and the Transformation of Early America, leads us on an exploration of the early history of New Orleans. During our conversation, Lo reveals details about the founding of New Orleans by the French in 1717; How and why New Orleans and Louisiana changed hands four times between 1762 and 1803; And, how the people and city of New Orleans became American and part of the United States. Sir Guy Carleton Branch is ringing in the New Year with a new web-site at a new URL: uelac.org/SirGuyCarleton/. Check out instructions for searching and getting the most out of 53,000 names in Carleton's Loyalist Index and more than 2,000 names in The Book of Negroes. Features include "The Ottawa Loyalist" newsletter, current and back issues, a list of 145 Loyalist ancestors proven by Branch members and a "sneak peak" at plans for UEL 2019 Conference hosted by the Branch. At the close of the American Revolutionary War in 1783, more than 100,000 residents of the Thirteen Colonies who had remained loyal to the King found themselves unwelcome in the new United States. Many had served in Loyalist Provincial and Militia regiments or had otherwise been active supporters of the Crown. Facing persecution by the victorious rebels, they were assigned new homes on land under British rule. In little more than a year, 14,000 Loyalists came north to carve the province of New Brunswick out of what had been part of Nova Scotia. Many settled along the lower St. John River, clearing farms from the forest and establishing the communities we see today. "Spem Reduxit," the New Brunswick Provincial motto, meaning "Hope Restored," survives as a testament to their confidence in a better future. Follow the Loyalist Route and discover the stories of their lives in the Lower River Passage. Check out The Loyalist Route – you can read more about each of the referenced settlement points on the interactive map, download a travel brochure, or download the GPS way-points. A list of UE Certificates issued since late in 2012 – showing the Loyalist ancestor, name of descendant (when permission is granted), branch and date – has been updated with the certificates issued in November of last year. The same updates have been applied to the Loyalist Directory. 4 January, 1760 - St. Paul's Church, Halifax, was incorporated. Established by royal decree by King George II. Construction of the church had begun in 1750 and was completed by 1763. It is the oldest building in Halifax and the first garrison church. 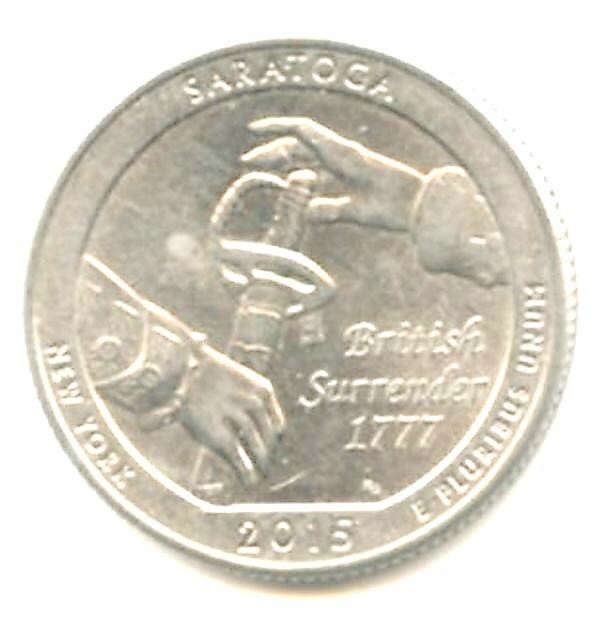 This was an unusual two-bits that came in my change - a commemorative quarter of the battle at Saratoga in New York in October, 1777. Submitted by Dave Clark. A flint and steel lighter, made of brass, steel, and flint and measuring around 10.75". It performed the same function as hand lighters do today. This piece was once owned by John Trumbull, Aide-de-Camp to George Washington. 6 Jan 1776 SC Council of Safety warns Georgia that British ships leaving Charleston are headed to Savannah. 11 Jan 1775 Francis Salvador becomes the first American Jew elected, taking a seat in SC Provincial Congress. Battle of Princeton fought on 3 Jan 1777. This list of the military equipment & personal goods in the possession of Anthony Morris, a Pennsylvania militia soldier who was mortally wounded in the battle, is the only inventory of its kind from the Rev War. 1 Jan 1781 1,500 men of the Pennsylvania Line – claim their enlistments are expired, intoxicated they kill 3 officers & leave camp at Morristown,NJ to march on Congress in Phila. Pennsylvania's Gen Anthony Wayne negotiates a solution avoiding a larger confrontation. 31 Dec 1775 Patriot attempt to take Quebec City fails disastrously & Gen. Montgomery is killed in the effort. Recently found this Our Loyalist Heritage coin issued by Queens County, Nova Scotia in 1983 in recognition of Loyalist Bicentennial and arrival of United Empire Loyalists in 1783. ...Brian McConnell. Townsends: While we prep new content, here is a video to let you all know how much we appreciate your continued support. You made 2017 unforgettable and we can't wait to show you what we have in store for 2018! The interesting historical record of life in late 1800s written in the stairwell of my parents house built in 1873 in Prince Edward County ON is now a story with Huffington Post Canada.